Asheville, NC: CATAPULT® by ECRS is the only retail commerce platform powered by Unified Transaction Logic™. Because everything works natively, it cuts costs, reduces complexity, perfectly synchronizes and executes at all transactional touchpoints across an enterprise of any size: point of sale, self-checkout, web store, inventory, loyalty, back office, e-commerce, and enterprise management. Now, this logic goes even further. 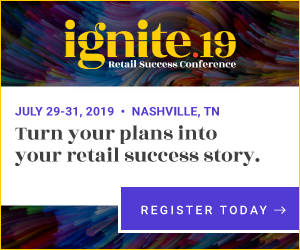 The company revealed the newest building block of CATAPULT at the Ignite 2018 Retail Success Conference. With the arrival of the AutoScale100, Unified Transaction Logic powers computational scale technology as well. It is the industry’s first and only native, Unified Transaction Logic-powered scale solution, giving retailers a seamless state-of-the-art enterprise scale capability. The AutoScale100 passed extensive in-store testing and delivered overwhelming customer satisfaction in trial phases, and has been officially certified by both U.S. and Canadian Weights & Measures. It is designed to handle a store’s most complex computing scale tasks including attended deli counter, meat counter, and unattended self service in bulk or produce sections. The AutoScale100 revolutionizes scale technology and how it’s used in grocery, deli, and retail. Sophisticated design meets an easy-to-use interface in a scale that can be configured and modified from headquarters and automatically synchronized to and from all store locations. With the AutoScale100, store operators can rest assured that they are providing an intuitive, automated, and accurate scale experience for their associates and customers, with each and every scale transaction. For more information about AutoScale100 or to place an order, please request a quote or contact our Customer Care team at 1.800.211.1172.